Technical problems abounded during the making of The Boat, including the fact that when a boat needed to sink, it adamantly refused to do so until Keaton and his crew jerry-rigged it to go under the water when required to do so. The Boat causes nothing but trouble for Keaton and his family. It begins by tossing him about while he's working in the cabin. When he stumbles out he finds his elder son swinging from the rope that holds it steady in the garage. After a swift spanking he sends him off. His wife (Sybil Seeley) comes out and he tells her that the boat is ready to launch. He attaches the trailer to his car's bumper, then notices that the boat is much bigger than his garage door. While the family waits in the car, Keaton dismantles part of the garage wall around the door. Nevertheless, when he drives off, he learns that he didn't remove enough: the boat knocks down the wall, causing the whole house to collapse. From the ruins he rescues the bow (the boat's name is Damfino) and the bathtub/lifeboat. Next they prepare to launch the Damfino. The car is on the pier, ready to drag it down the launch ramp. Keaton starts rolling, but his older son is playing in the water on the boat trailer. Seeley sees him and yells, but Keaton doesn't hear her. She grabs a rope and unsuccessfully tries to stop the boat. Meanwhile, the front of the car goes off of the pier's end. Keaton tries to haul it back, but gives up and cuts the rope. The car sinks like a rock. Keaton hauls the kid off of the trailer and stations him behind Seeley on the boat rope. He ties the vessel to the trailer and the trailer to the dock. They christen it with a bottle of Coke that is tougher than the bow, so he smashes the soda with a hammer. Seeley and her son unloosen the boat's rope. With Keaton standing proudly on the deck, the Damfino slides straight to the bottom of the sea. You can't keep a good boat down, so the Damfino, recovered, floats at the dock while Keaton and his elder son make repairs. Keaton slides the smokestack over the kid, and after he figures out where the yelling is coming from he picks up the pipe and his son shoots out the other end into the water. He throws in the life ring, checks the water temperature with a thermometer, and trips into the sea. Once he pushes the kid and pulls himself back in, he deposits the wet offspring with his mother below deck. She chases both kids out with a broom. Keaton starts up the motor. Unfortunately, he forgot to untie the boat and he pulls the end of the dock, along with two people sitting on it, into the water. The Damfino zips along. Before they get to a low bridge, Keaton pulls a lever and the smokestack, mast, and lifeboat lean on to the deck. An inattentive Keaton almost misses the second one, but the third bridge gets him: as he adjusts the flag, the tall bits crash to the deck and knock him into the water. He swims (fast) after the craft, catches it, and stops it. He throws the anchor overboard, but it floats. "Ten seconds later" he has repaired everything. He reels in a fish and lowers it to Seeley. He starts the boat then joins his family below. Seeley serves rubber-tough pancakes and the men hide them rather than eat them. The boat goes up hill and downhill (via a tilted camera) and the table lurches back and forth. To begin to clean up the mess, Keaton nails a painting of the sea to the wall. Salt water floods through the hole; at first it seems to be the ocean in the picture. Then he pulls off the artwork and nails up a pancake to staunch the flow. Seeley brings in the rest of the meal, but a speedboat's wake upsets the craft and their dinner. Keaton goes above and nails the wheel, freezing it, to prevent future accidents. Darkness stumbles and falls, so the family prepares for bed. When Keaton climbs into the top bunk, it collapses, so he sets it up again. A storm is brewing and water crashes through the porthole, soaking him. He goes on deck to investigate, but his candle goes out and he falls into the water as he tries to re-light it. He climbs back in, regroups below, and brings up an umbrella and a telescope. The former blows away immediately, and the latter droops badly. He falls out again and climbs back in. After he leans on the mast, which collapses, he goes to the cabin and stows his family in the galley. His radioed "SOS" raises the Coast Guard (Eddie Cline), who asks who it is. "Damfino" gets only the response "neither do I." 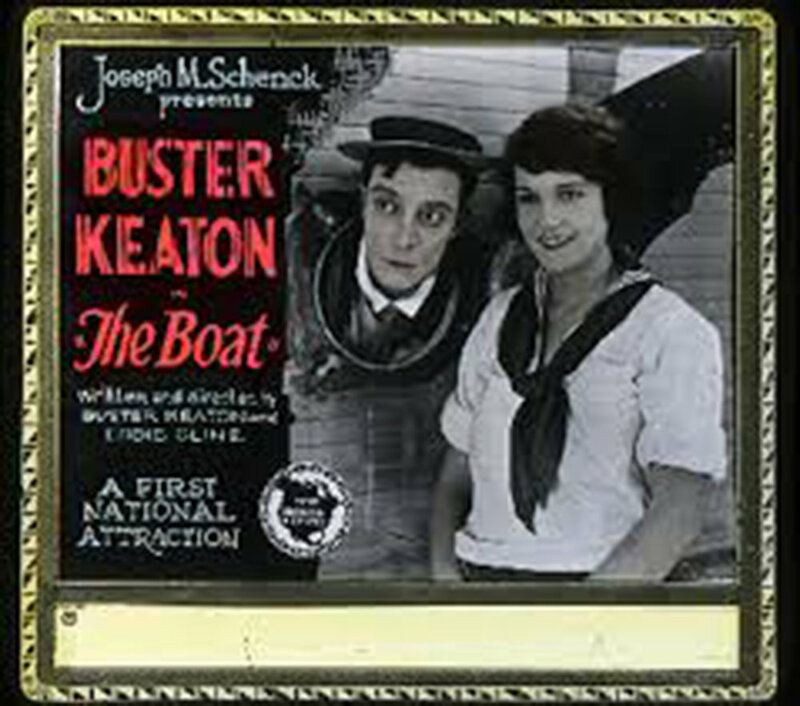 The storm rolls the boat over and over; Keaton is caught in a revolving tunnel (like the amusement park ride). He tries nailing his shoes to the floor, but they don't stick. When it stops he checks on his scrambled kin. The pancake patch springs off the earlier leak; to deal with it Keaton drills a hole in the floor. This just lets in more water and the boat floods. The group gets tangle up in their life vests, so they abandon them. They go up on deck. Keaton lets down the lifeboat/bathtub, packs his family into it, and sets it adrift. He bravely goes down with his ship, leaving only his hat afloat. His loved ones mourn until he pops up under his hat and swims to the lifeboat. The family floats in the tub. His older son wants a drink, so Keaton opens up the bathtub spigot and collects water in his hat. All goes well until the older boy pulls out the tub drain plug. As they sink, they prepare to die. But then they stop sinking - the water is only two feet deep. They get out and walk to the shore. When Seely asks where they are, Keaton responds with the boat's name.